That would be Transylvania University, the tiny liberal arts school in Lexington, Kentucky with just under 1000 undergraduate students, whose golf team (the Transylvania Pioneers) competes in the Heartland Collegiate Athletic Conference of NCAA Division III. Its alumus, 27-year-old Justin Tereshko, would share the lead at the midway point of the Monroe on his way to a T9 finish. 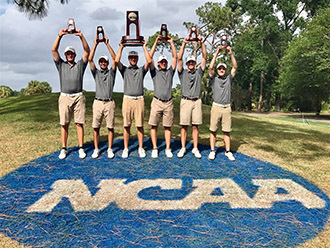 That top-10 was one of a string of recent performances that has seen the former D3 All-American rise to the #5 spot in the AmateurGolf.com Mid-Amateur Rankings. Though he finished his college playing career five years ago, Tereshko has never left college golf. Less than a year after graduation, and at the age of 22, he became a head golf coach at Huntington College in Montgomery, Alabama. He then moved to DePauw University in Greencastle, Indiana, serving as an assistant before relocating to Guilford College in Greensboro, North Carolina, earning his second head coaching job at the age of 24. Now in his fourth season at Guilford, Tereshko continues to thrive in Division III golf, leading the Quakers to two Old Dominion Athletic Conference titles in three years, and a runner-up finish in last year's NCAA Championship, with only two shots separating them from the winners. His own game has grown as well. Since 2014 Tereshko has played in two U.S. Amateurs and two U.S. Mid-Amateurs, making match play in all four, and he finished third in last year's USGA State Team. He was one of only two mid-ams to qualify for match play at this year's U.S. Amateur at Riviera. After runner-up finishes in the previous two years, he broke through to win the North Carolina State Amateur earlier this year. He has recorded high finishes in national amateur events like the Porter Cup, Crump Cup, Dogwood Invitational, and the Monroe. 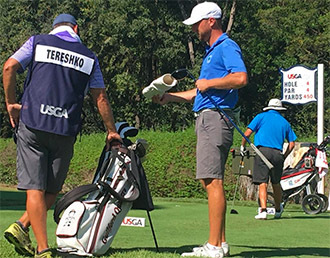 With no plans to ever turn pro, Justin Tereshko is a name we should be seeing on amateur golf leaderboards for years to come. Will you put the clubs away this winter and if so, for how long? Yes, but not by choice! I injured my right knee so I'll be out at least a few months. Favorite course(s): There are three that are above and beyond the other courses I have played: Pine Valley, Riviera & Bel-Air. But my favorite is Pine Valley. Something golf-related that you collect: Drinking glasses. I have wine glasses, pint glasses, and bourbon glasses from various courses I’ve played. If you just watched me hit balls on the range you would think that there is no way a guy with that swing and that grip can break 80, let alone shoot under-par. Those that have seen me play would tell you my swing goes as far past parallel as John Daly and my grip is worse than Jim Furyk’s. I guess you would call my grip a interlock, triple overlap; the only fingers on my right hand that are on the club are my index finger and thumb. I have only ever had two golf lessons and the last one was in 2010. I do not have a swing coach. My golf game is fairways and greens. This year I hit about 65-70% of my fairways and 75-80% of my greens. BALLSTRIKING. Putting is what tends to be my downfall; I struggle with the putts from 8-12 feet. There have been tournaments where I have missed over 15 birdie putts from that length. I have to hit it closer to make sure I make birdies. Your identity: Are you a player who coaches golf, or a coach who plays golf? I think I am a coach who plays golf, although others may disagree. My father was a college football coach for 27 years (and college golf coach for 10 of those 27 years) and my mother was a high school swim coach for 10 years so I would say coaching is in my DNA. I could have turned pro after school and given the dream a run but I decided not to because I would rather coach golf for a profession rather than play golf for a profession. Is it a perk of my job that I am still able to play competitive golf? Absolutely! I enjoy being around the college kids, I enjoy the van rides, I enjoy working with them each and every day during the season. I like that I can mold them and teach them lessons that will hopefully stick with them for the rest of their lives. The U.S. Amateur in 2014 at Atlanta Athletic Club. Prior to that tournament I had not played in any events the previous two years other than Indiana Golf Association events. Not only was I surprised I qualified, I was just happy to be there. Then I shot 71-71 in stroke play and ended up the 24th seed in match play, and in the round of 64 I drew Xander Schauffele who now obviously everybody knows [as the 2017 PGA Tour Rookie of the Year and winner of the PGA Tour Championship]. I did not know anything about him and I made 7 birdies in 12 holes and beat him 7&6. Then I played Jimmy Mullen and lost in 23 holes; the following year he went 5-0 in the Walker Cup for GBI. I didn’t realize what I was capable of until after that U.S. Am and it gave me the confidence that I can compete with the best amateurs in the world. The same event, the 2014 U.S. Amateur. In that match against Jimmy Mullen I had a putt on the 18th, 19th, and 22nd holes to win the match. All three putts were about 10-12 footers. I conceded a putt to Jimmy on the 22nd hole that I thought was about a foot to 18 inches away from the hole. People told me afterwards it was about a 3 footer. The ball had rolled out further than I thought. It haunted me for awhile because he could have missed that putt. When did you first know you wanted to be a college golf coach, and what went into that decision? I actually had no clue what I was going to do after I graduated college but at the NCAA Championship (the week before graduation) I talked to Huntingdon College’s head coach Matt Mahanic about him needing an assistant. He called me the following week and offered me the job. I wanted to do something that involved golf and coaching seemed like the perfect fit. I didn’t think I could make it on the PGA Tour so I decided not to turn pro and go into coaching. How does being an active competitive golfer help you as a college golf coach? It is a huge advantage for me. It also helps that I am so close in age to my players. I think I understand the college athlete mentality, how they think about school and how they play golf and plot their way around a golf course. When we are going over a game plan for each tournament I have "street cred" (I think that is how the young kids say it). They all know that I play competitively and most of them have played in a tournament that I also played in. I also have played with a lot of guys that are playing on the tour and I have seen first hand what it takes to make it and where my guys need to improve. And the answer is simple: put the ball in play in play off the tee, and have an incredible short game. You don’t have to hit the fairway, you just have to have an opportunity to hit the green in regulation. Sounds simple but its amazing how some college players do not understand that. On a scale from zero to Phil Mickelson, how aggressive do you play and how aggressive do you want your players to play? No one is as aggressive as Phil Mickelson but I am pretty close. I hit driver everywhere, I go at a lot of pins, I try shots that most people would never try. As for my players, I encourage them to be aggressive. Not all of them necessarily are aggressive but I give them green lights on drivable par fours and going for a par five in two when most coaches probably wouldn’t. Sometimes it works out for them and sometimes it doesn’t. That’s why I try to teach them when it is a good idea to be aggressive and when it is probably a good time to be conservative. For players who come into your program, in what area of the game do they typically need the most improvement: the technical (golf swing, short game, etc. ), the physical (strength & conditioning), or the mental game? I am not a swing coach or instructor and I do not pretend to be. I know enough to help them out with their swing but I never make any big changes as they all have swing coaches. With the players I bring in I work mostly on short game, mental game, and course management. It is amazing how many shots can be saved a round on those things alone. I try to instill in my team that if you can save one shot per round on each of those three things that adds up 12 shots per round for the team and that adds up to 48 shots saved throughout the course of four round tournament! We lost the NCAA Championship by two strokes. We had 1,182 strokes; that is a lot of golf shots. You have to mentally stay in it regardless of what has happened because you can’t change the past, only the future. You played Division III golf and coach at a Division III golf program. What are the advantages of playing D3 golf over D2 or D1? I try to sell to my recruits that you should come to Guilford so you can be an All-American and win a National Championship. I go after guys who could play D1 but I try to convince them to come play D3. Now I’m not going after the same guys that the Power 5 conferences are going after. I am going after the ones who are being recruited by the bottom half of the D1 teams in the Golfstat rankings. Some kids just want to go D1 to tell others that they got an athletic scholarship and to tell people later in life they were a D1 athlete. There is nothing I can do to change the mind of that kid. They may play all four years at a D1 school but never come close to winning a conference championship therefore never coming close to playing in the NCAAs. But I can change the minds of some by asking them "do you want to come play for National Championships and the opportunity to be an All-American and the best player in the country for D3?" D3 also offers a better education in my mind simply because of small class sizes and the ability for each student to have a good relationship with professors who actually know their name. You can’t get that at a big D1 school. You’ve been a mid-amateur since 2015. What’s the biggest difference you’ve noticed between playing in top amateur tournaments and top mid-amateur tournaments? I have actually only played in three mid-am events: the Crump Cup (once), the Gasparilla (twice) and the U.S. Mid-Am (twice). I have not received many invites to play in mid-amateur events but quite frankly I’m not sure I could play in most of them. My contract with Guilford College is a 10 month contract running from August thru May, which means I get June and July off. There aren’t many mid-am events in the months of June and July. I do make my team’s schedule which gives me a little flexibility but I will not compromise my team’s strength of schedule for me to go play in a golf tournament. The biggest difference I have seen between amateur and mid-amateur tournaments are the golf courses. Some of the top mid-am events are at courses like Pine Valley, Seminole, L.A. Country Club, and The Honors Course. Some of the amateur events that don’t change courses year to year are at courses like Pinehurst #2, Sunnehanna CC, Monroe GC and Druid Hills, which are not bad golf courses but you can’t beat that mid-am lineup. I don’t know if the PGA Tour could beat that mid-am lineup!